Need more information about booking Home 3376380 ? Tourist residence in an exotic setting for all budgets. Very quiet environment with several comfortable apartments close to the beach and shops. The residence includes a slate pool and tropical garden where grow exotic fruits and flowers. Price is negotiable depending on the number of people . Choose from 4 apartments for rent with either 1 bedroom (2 sleeps) or 2 bedrooms (4 sleeps). In addition, 2 studios for rent can also accommodate 2 people each maximum. In addition, you can enjoy the beauty and wellnesscares offered by the Institute of residence. Please don't hesitate to contact me for further information. There 80 meters from the residence to the bus stop. I stay at the residence and I will be available during their stay. - Parties are not allowed. - Guests are not allowed to consume drugs which are illegal in Mauritius. - Smoking is not allowed inside the apartments. This Apartment has 2 bedrooms, 1 bathroom and sleeps 4. It’s been listed on Holiday Lettings since 11 Mar 2013. 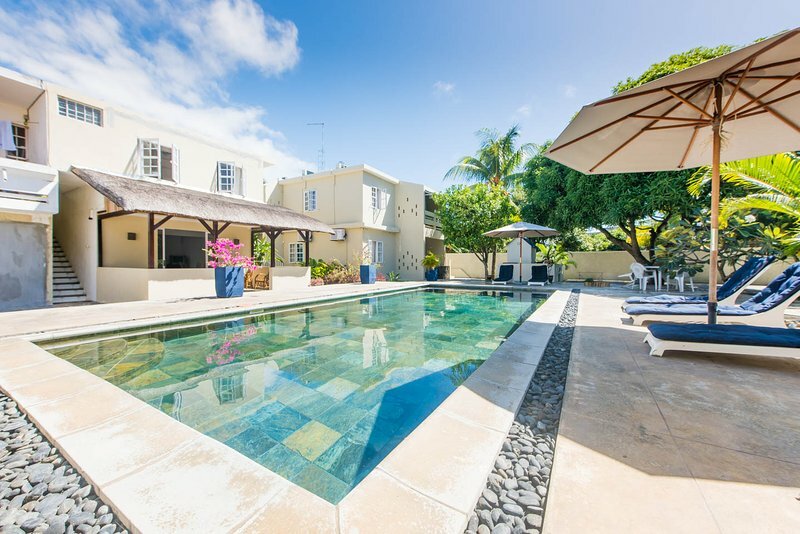 Located in Grand Baie, it has 136 reviews with an overall rating of 4.5. The average weekly rate is £417. The Owner has a response rate of 100% and the property’s calendar was last updated on 14 Mar 2019. You can get in touch with Manee (the owner) through the contact form on this page. Send Manee (the owner) an email through the contact form on this page. Alternatively, if there’s a phone number on this page, you can call them. How do I contact Manee (the owner)? If you’ve already booked, go to Manage your holiday booking to view Manee the owner's contact details or send them a message. Or send Manee (the owner) an enquiry through the Contact the owner/manager form if you’d like a quote or more info first. When you pay online through the Book your stay form, a booking request is sent to Manee (the owner). You’ll find out within 24 hours whether they’ve accepted - no money will leave your account before then. You can also request a quote from Manee (the owner) through the contact form. The owner will email you the total cost for your dates and a link to book and pay online. Use the Book your stay form to pay provisionally online. You can pay by credit/debit card or PayPal. Manee (the owner) will have 24 hours to accept the booking and no money will leave your account before then. Why can't I call Manee (the owner) before booking? You’ll need to contact Manee (the owner) to do this. Send them a message in Manage your holiday booking or through the contact form on this page. You can request to change the dates or number of people on your booking via the Manage your holiday booking page. To change your holiday dates use the Edit booking button. If you need to change the number of guests staying then send Manee (the owner) a message. If Manee (the owner) agrees, they’ll send you a revised quote outlining the changes. You can review and accept/decline this from the Manage your holiday booking page. You’ll have 48 hours to take action before the revised quote expires.